If you’re one of those folks that think there are only 3 Gili Islands in Lombok, this article will be especially revealing for you. First of all, there are 33+ Gilis in the area; second, Trawangan and its twins aren’t the obvious leaders. True, the tourists looking for comfort, advanced infrastructure, and fun, will definitely appreciate what they have to offer. At the same time, spots like Gili Kapal are all about solitude, peace, and unity with nature. Some of us like to visit only the most “trendy” spots and don’t really care about anything else. Others prefer to hunt for the “hidden gems” and enjoy an entirely different atmosphere while in Lombok. As always, the choice is yours, and Gili Kapal has enough pros over the more popular siblings to consider it as your next destination. While most locals know East Lombok Regency by heart, the foreigners are calling it the “undiscovered” part of the island. That’s because it’s a lot less popular than, say, the central and western regions. Therefore, the tourist flow is not that strong and during the low season, you might be the only person in Gili Kapal or the neighboring islands. Yes, it is surrounded by other Gilis, much bigger ones, and I highly encourage you to take boat trips to every single one to make this journey even more exciting and memorable. What Is Gili Kapal All About? Take a good look at the map: isn’t Kapal the tiniest island you’ve ever seen? It’s surrounded by Petagan in the north, Pasir in the south, and Kondo and Bidara in the east. All those spots deserve a visit. While they’re not particularly different from each other, you’ll still find that they all have their unique features. Besides, a change of scenery is always nice, especially when it doesn’t cost you much. The most important thing you need to know right now is that none of those Gilis have any public facilities, which means the tourists will have to rely on their own. You won’t find any warungs/food stalls or hotels/bungalows in Gili Kapal or the other islands in the area. For some, that will be a huge disappointment; but I personally think that it adds a certain kind of mystery and makes a man/woman think like they’re on uncharted, never-seen-before lands. As a general rule, trips that last for a couple of hours don’t really require much planning. A couple of snacks and drinks in the bag and you’re ready to go. Or, just have a nice meal on your way out to travel light. On the other hand, if you’re planning on staying in Gili Kapal for the better half of the day (or even several days), make sure to pack that bag with more food/drinks, some sun cream, a repellent, and dry clothes (in case you want to dive into that crystal-clear water). There are enough hotels and restaurants on the eastern shore of Lombok. They are pretty expensive, however, so, if you’re on a budget or simply don’t want to pay more for the view, move a bit “back”, closer to the center: the prices there will be significantly lower. If you’re traveling with a big crowd, it might be a good idea to also grab a tent, as it will be perfect for camping out and creating that once-in-a-lifetime tropical atmosphere. Gili Kapal might not be the best choice for that, but, say, Petagan will be just right. Interesting fact: back in the day, there used to be a lot more islands in the area. Unfortunately, most of them are under the water now. The locals claim that it is the gods of the seas that take away those Gilis to keep the balance intact. I have to say it again – Gili Kapal is incredibly tiny and when you’re standing in the middle of it, it feels like you’re just floating in the sea and the island is a small raft. Lying there and watching the clear sky, I thought that I was the lone survivor of a shipwreck for a moment. Check out the photographs again: this spot is so tiny that it’s going to be hard to find it on Google Maps! The beautiful white sand and the turquoise water are pretty much the only things that you’ll see there. Obviously, that doesn’t give the tourists much space to enjoy their trip. Apart from walking around with your friends, checking out the dolphins and admiring the view, there isn’t really anything else to do. As I said earlier, don’t focus on one island: go out there, explore the other Gilis in the area. If you’ve got a drone with a camera, that will give you an opportunity to make some of the best pictures of the year. If not, well, selfies will also do. The fans of water activities will be pleased to learn that Gili Kapal is equally great for swimming, diving, and snorkeling. No, there isn’t a place to rent the equipment in the vicinity, but there are enough renting spots on the eastern shore of Lombok. The newbies will be overwhelmed by the underwater life. Even the pros will be impressed by the corals and the various species of fish. Note: there might be some tiny rocks on this island, which means you should never take off your shoes; otherwise, you’ll end up hurting your feet. For getting a tan while lying under the sun, it would be wise to put a pair of glasses on and use a hat to cover your head. I almost forgot: watch out for those water currents: when they’re strong, and the tide is high, Gili Kapal gets lost under the water. Make sure you’re not there when that happens! I told you more and more islands are going to be lost soon, right? Well, you can witness that with your own eyes today. As I always like to say, it is imperative to know in advance what a certain tourist spot is all about. Gili Kapal is about that “Pirates Of The Carribean” type of an adventure. If you like the sound of that, then by all means, pay it a visit. But if a big, crowded island with tons of warungs and food stalls is on your mind, then this destination won’t bring you much joy. The only way to get there is by using a boat (some people prefer to fly over in helicopters, but they are very expensive and aren’t always available). You won’t have a problem finding a fisherman with a boat in Sambella. Just ask the locals how to reach Gili Kapal and they’ll tell you where to get a boat. It will take you a couple of seconds to go from one edge of this piece of land to the other one, which doesn’t really make it an island, per se. The locals prefer to call it Gosong (sandbar), and that’s actually a better name for it. 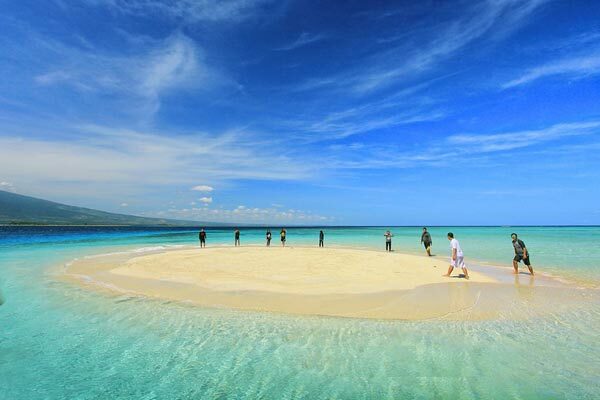 If you get lucky and pick just the right time when the high tide is gone, but most of Kapal is still covered by the sea, it will seem like you’re walking on water! That huge island on the right is Sumbawa, by the way. According to the experience tourists, the water in this area is almost 100% clean and there aren’t any plastic bags floating around. The biggest downside: when the sun starts to blaze, no cream will be able to protect you. We already talked about renting boats on the shore. Now let us discuss the best ways to get there. Most of us land in Lombok at the International Airport. It is one of the busiest places on the island and the foreigners won’t have a problem with hiring a taxi, renting a car/bike or even using public transportation. To reach the closest beaches with boats heading towards Gili Kapal, you’ll have to drive for 2 hours and 30 minutes, give or take. The road is 80 kilometers long and the route lies along the picturesque eastern shore of Lombok. In order to avoid heavy traffic, the tourists should pick a longer route that lies through Central Lombok. Naturally, from Kuta, the road will be the same, only a bit longer. From Mataram, the visitors will be driving for up to 3 hours. As you can see on the map, the path cuts Lombok in half, so to speak. Finally, if you’re in Senggigi Beach right now and still want to visit Gili Kapal, it would be best to pick the route that lies along the western shore of Lombok. It is considered to be the most beautiful part of the island. Obviously, the fans of adrenaline will prefer to rent a bike and drive all the way up. The more mature and experienced tourists might choose a taxi over a rental as they already know that a long drive can be quite tiresome. This is the tiniest island I've ever been to. We raised our flag while the ocean was raging - a totally mesmerizing moment! Never been to this part of the island. Kapal is definitely a must-see spot. Petagan is a far better pick for camping, enjoying the view, and walking around. But Gili Kapal is unique! Swimming and snorkeling are the best activities in this area. As for this island, it's smaller than my backyard! Renting a boat is cheap in East Lombok, which is exactly why you should do as much sailing as possible.